It was around seven o'clock Sunday night. 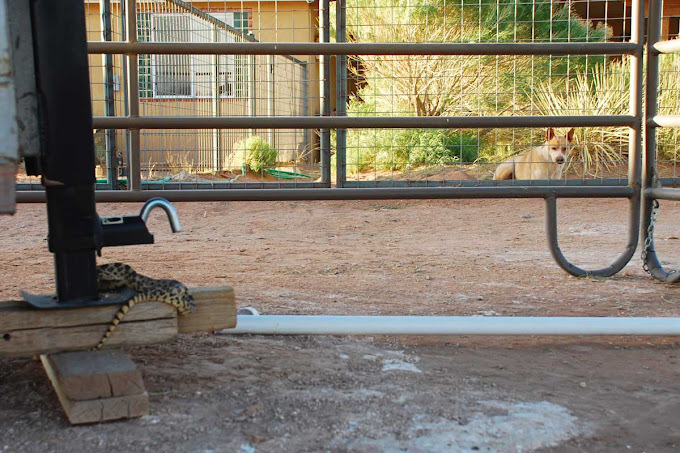 I was in the corral working with Lucy when I heard Smooch barking bloody murder in the backyard – it was unmistakably her snake bark. I had forgotten just how loud it could be. 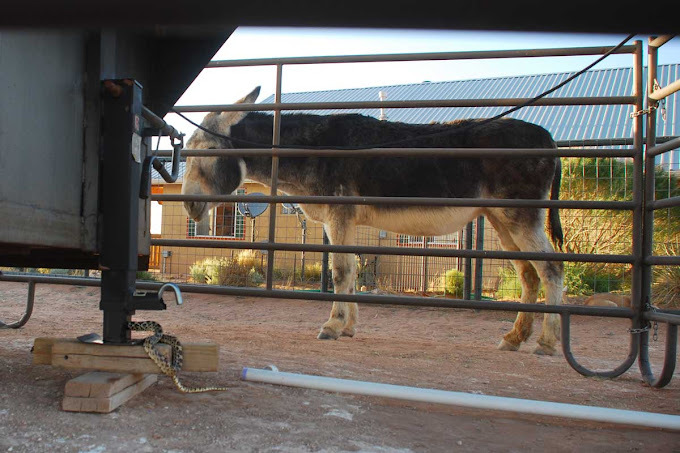 I went over to investigate and found Smooch's attention laser-focused on the jack of the horse trailer. if you would extricate yourself and find someplace else to take your nap. I stomped the ground, kicked the planks, and poked the snake with my toe. He wasn't moving. Hmmm. I fetched the snake pole, got a good grip around his body and gave a tug. He didn't budge. He was stuck. 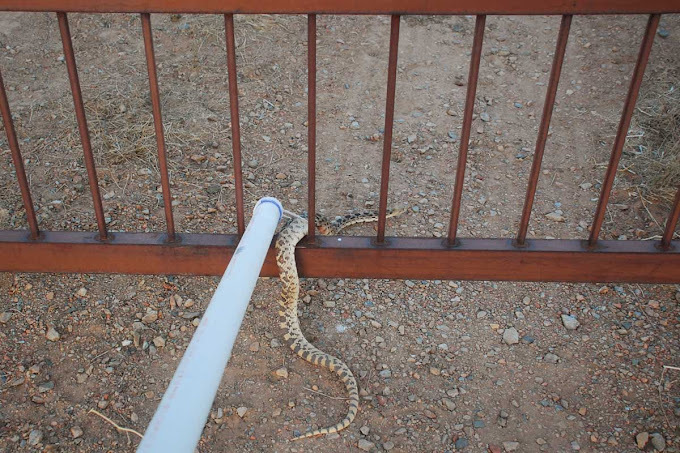 Me: Come on, Snake. You've got me a little worried here. I don't want you to die on my watch. Let it be known that you are witnessing the first time I've ever picked up a snake with my hand. Much to my surprise, it was not slippery and slimy. More like a skinny cat without hair. That's it! A bald skinny cat. Back to our story. By now, I was starting to feel sorry for the snake. How embarassing he must have felt knowing he was being photographed with his head stuck in a hole for all of you to see. And I'm quite sure he was old enough to know better. This was no youngster. My foot is 9.5 inches long, so I estimate there were about four feet of snake on this side of the hole. And no, I wasn't running around outside in my socks - I just didn't want you to see my pathetic, beat-up barn shoe. and I was racking my brain trying to figure out a way to free him. Smooch: I tried to warn you yesterday that a snake was over here. I could smell him, and I dug a big hole trying to find him, but did you listen to me? No! You filled in the hole and made me dig it all over again to prove my point! Me: Smooch, you have my deepest apologies. I should have known you never do anything without a good reason. While Smooch and I were working on our communication issues, Lucy came over to stand watch. We discussed if we should tug on the snake again or wait until the WD-40 did its thing. She suggested I go back in the house for awhile and have a glass of wine. Such a smart, intuitive donkey my Lucy is. She would let me know when and if the snake moved. I looked out the window. Was the snake still there? Hard to tell from a distance, so I took a few steps into the backyard. Lucy: Mom, why are you running around like an idiot? The conversation went on like that for at least five minutes. Smooch kept circling the snake and would not let up. I didn't want her to get bit, so I bopped her in the head with one of her toys. She must have thought the snake hit her because she ran to the other side of the yard. I picked her up and tossed her in the garage. Lucy: Wow, mom, I've never seen you move so fast. Why is your face all red? With Smooch out of the picture, the snake and I calmed down. I went to fetch the snake pole. Me: Well, Snake, I hope you've learned your lesson. I see a little blood, but the injury does not appear to be serious. Let's get you out of here. This backyard has enough holes in it. Out the gate, down the driveway, and out to the entrance we went – that would be about 400 feet. ...but I was wearing my slippers at this point. I took one last look at the trailer jack before I went in the house, not sure of what I would find. Well, isn't that interesting...there's a nest in the hole! The snake must have been going after the nestee. 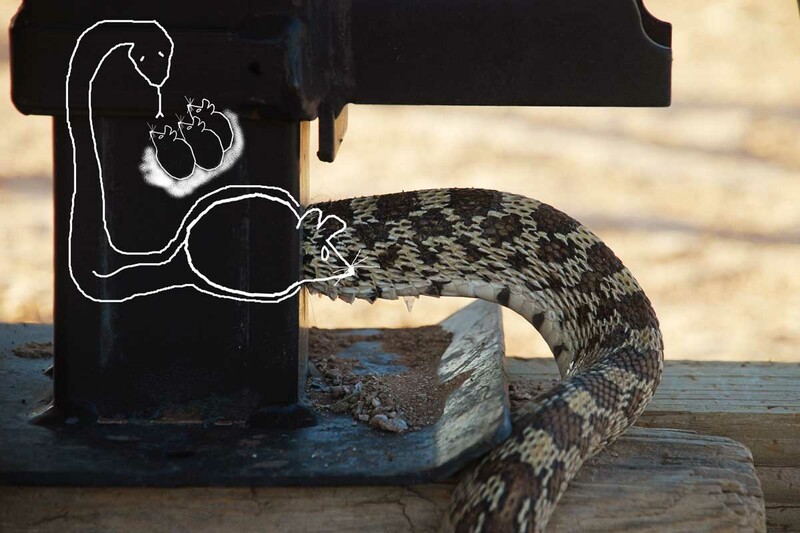 The snake swallowed a mama packrat who was too big to fit through the hole in the jack. He was stuck until he had digested enough of her that she was small enough to pass on through. So the WD-40 probably had nothing to do with his getting unstuck. Which is really a shame because I was hoping to add the coolest-ever submission to 2000+ Uses for WD-40: "Lubricates and releases bull snake stuck in horse trailer jack." Wow, wow, wow ... what an adventure! I guess that teaches us all that we should listen to our pups when they're trying to tell us something, but who'd a thought a snake would go that far to get a meal! WHAT A STORY! Just about the limit! I will remember it everytime I see a WD-40 aerosol can. Clever Smooch, she sensed the drama. Wow, there's never a dull moment at your place, is there?! 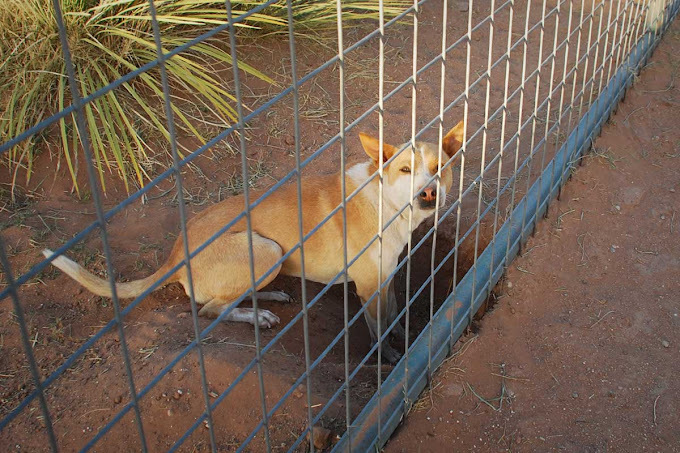 Great rescue photos and mystery solving. Perhaps it should be a children's book...Detective Smooche's big adventure! I have a similiar story from my weekend, albeit not as tricky. My next door neighbor spotted a good size black snake in the grass, and started screaming bloody murder. Most people in my neighborhood kill snakes (which really pisses me off! ), but fortunately I was outside, and able to come to the rescue (the snake's that is). I grew up a country gal, and grabbing a snake and hauling it off is no big deal. So I grabbed this guy behind the head, and headed off toward a wooded area nearby, and of course, in bare feet! Hopefully the snake has the good sense to stay away as he might not get so lucky next time. SEND THE STORY & PICTURES! the WD-40 people will love it and they should pay you to use it. 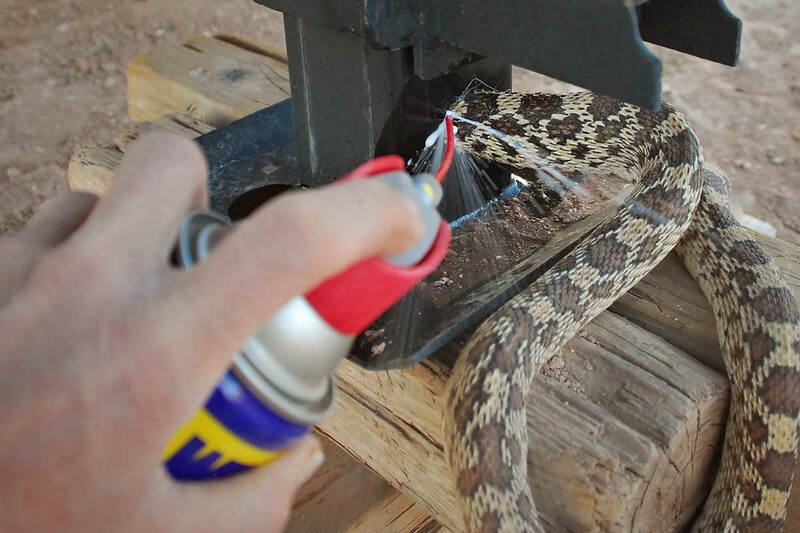 I can NOT believe you sprayed the snake with WD-40! Ha haa!!! Poor thing. Your analogy seems about right though. Smooch is one smart cookie. When Lily barks I usually know what she's trying to say also. She always attributes certain pitches to certain situations. Oh, my~ WD-40, eh? That's interesting! You absolutely have to submit this to the WD-40 people. You make me want to run right out and buy a case of the stuff. Right now. While I'm still wearing my slippers (and laughing)! One of your best stories ever. You really are a do-all person. WD-40? Who would have know? Oh Carson, I swear I love this blog! Never know what to expect and it's always such an adventure! Well, if your theory was correct about the mama packrat at least he wasn't hungry while he was stuck. Never thought a snake would get themselves stuck like that, not so smart I guess. Nice work getting him out, the WD-40 definitely helped! I thought you had brought out the Pam Cooking Spray! 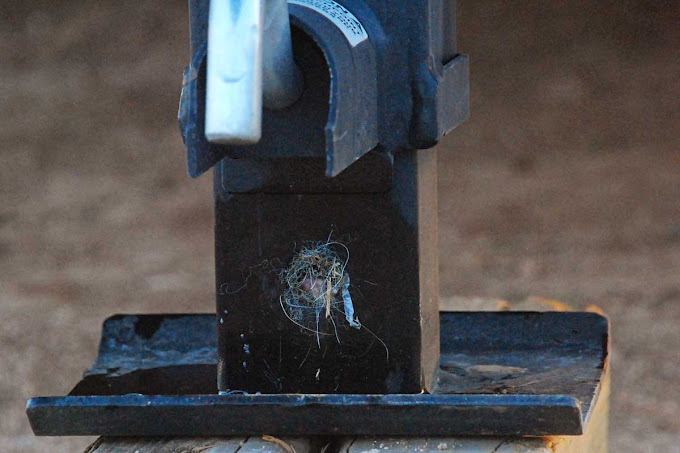 Is there a way to block that hole to prevent future nests and snakes getting in there? Whoa! My bloods running faster just reading about it. Yea Smooch! Sure, tell WD-40. They don't need to know about the mama packrat theory. And how do you know that the WD-40 didn't help some anyway? That was the MOST entertaining post I have read in a long time. I was literally laughing out loud at the WD-40 part. Who knew the stuff was so versatile! I love your drawing at the end. So cute. LOL. You're lucky to have a snake dog. We had a German shepherd mix when I was a kid who hated snakes with a purple passion and killed a lot of them. He was a great guard dog. Your theory was actually my first thought, mostly because I am a long and twisted Gary Larson fan. In the Prehistory of the Far Side he describes a panel that didn't go over well with the editors...a boa that had slithered through the slats of crib, eaten the contained baby and was, as a result, too fat to get out. Great post! Oh my goodness! I saw the tweet and wondered what the heck is going on now. I get it!! How crazy is that?! Glad you got him unstuck. That's just SO bizarre!! You are so amazing at all the things you deal with out there :) Good job girl!!! Why must nature always have these scenarios that present us with the dilemma of who to root for? 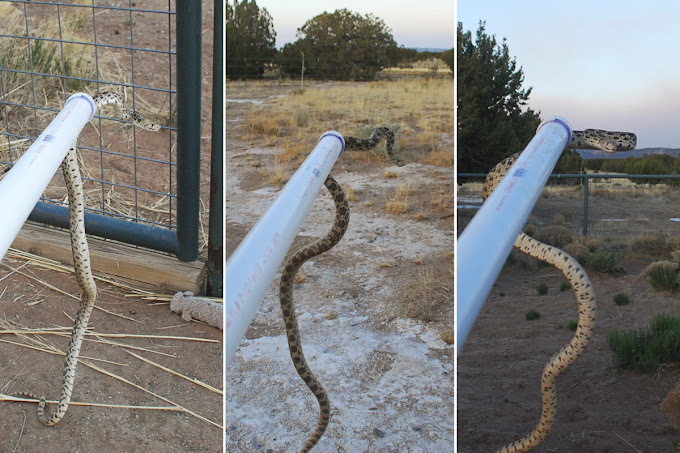 I'm so happy that the snake was freed, relatively unharmed, and no ranch hands were hurt in the process. I'm not so happy that a momma packrat may have been eaten(!) and I don't even want to think about any babies that may have been consumed as well, or worse yet, left to fend for themselves and face a cruel and inevitable death. Aaarrgh! It's too much for me to wrestle with first thing in the morning. I'll go back to thinking about the happy snake and the good dog. 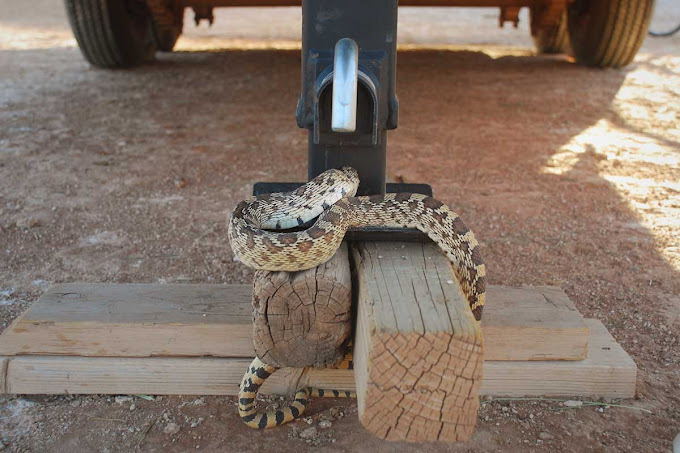 Good snake for getting rid of at least one pack rat! Wow! What an adventure! What a good dog! You should email the makers of WD-40, they'd probably get a kick out of yet another use for their product. I love that they now have the nozzle permanently attached to the can-no more hunting for the red straw. Who needs television or social media when you have high drama like this going on in the backyard? 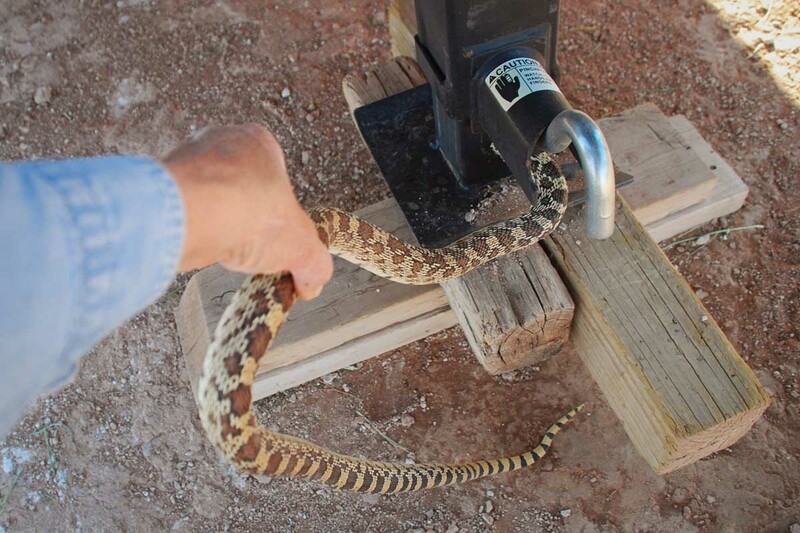 That was cool, so glad it was not a rattler. Reads like a great "who-dun-it" novel. Both hubby & I were on the edge of our seats - well, there really wasn't room for both of us there!! Great story! May I suggest a children's book? Happy ending and all! 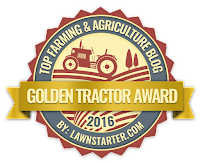 I always enjoy reading your blog, but this was one of your best yet. I've been lurking and reading your blog for a while after a friend suggested it, and I just have to say... that's awesome! :-) I love the stuff you post! Ha! You are a hoot!! 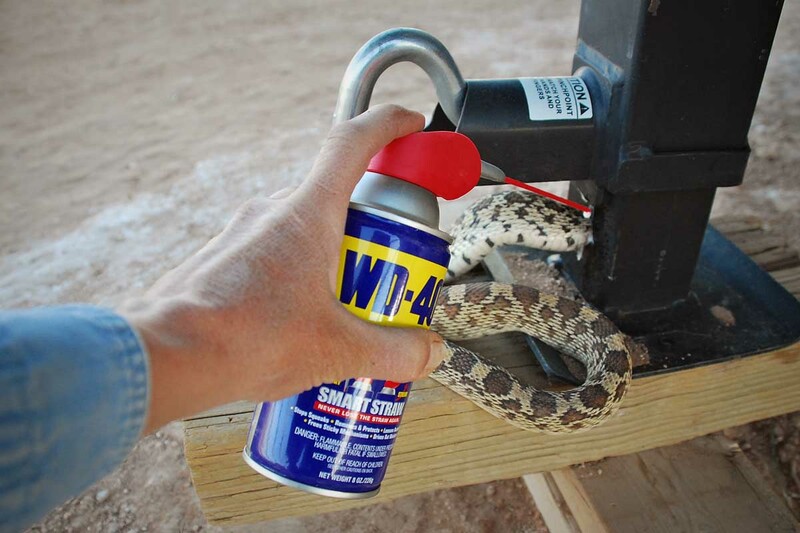 I would never have thought WD-40 would be a good idea--I would worry it would harm the snake. Good on you, Carson. WD40 is my best friend too. I use olive oil on delicate situations as well. Great news that the snake escaped into snakeland. They come with the territory. 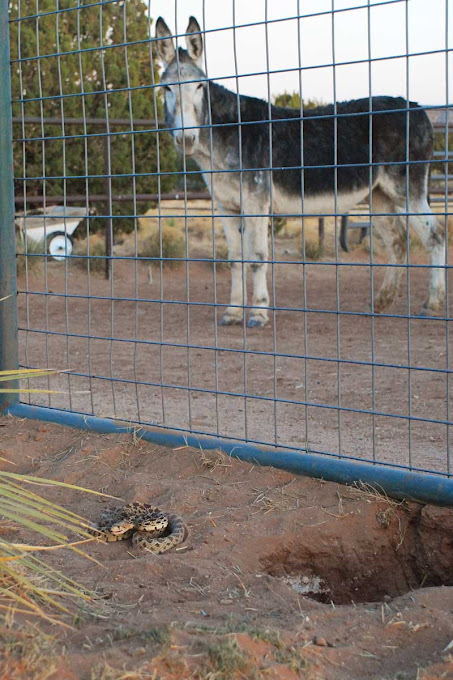 We'll be waiting for more snake and coyote stories. All in a day at the farm. I just laughed hard enough that my head hurts...best blog post ever. 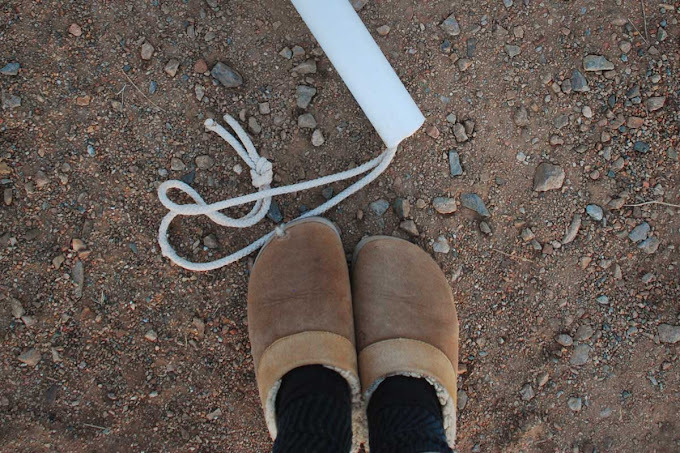 This may go down as one of my favorite blog posts ever!!!! I love that you stopped to take pictures, I love that you commented on the feelings of embarrassment of the snake, and I love that you drew what you think may have cause the snake to get stuck!!!! Great job on the snake rescue!!!! Poor baby mice, probably terrifed! Having a huge dragon invade their home and eat their mom! and then not leave. And then noxious fumes vanquish the dragon and they are left motherless... Not to mention all the carrying on in the neighborhood! PS: thats not a slipper, its a all purpose indoor/outdoor shoe. Goes from snake wrangling to couch lounging in one step! 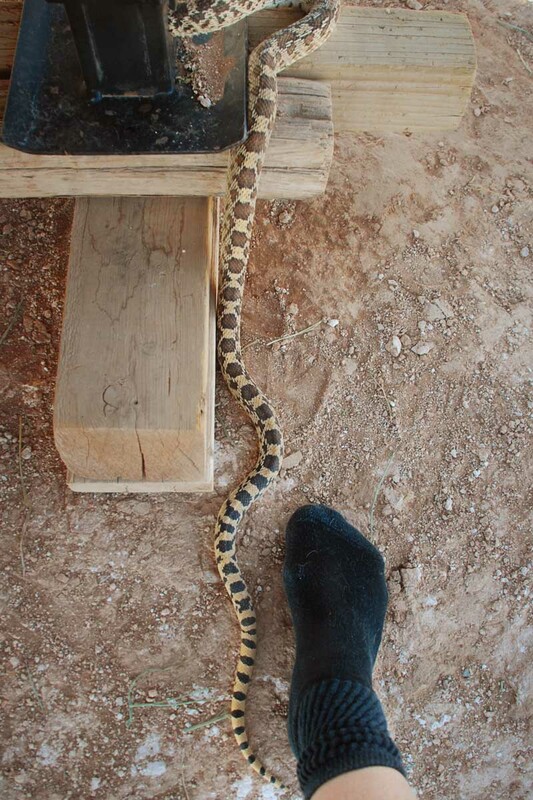 We have this one bullsnake that visits us at least once every summer. I am guessing it is the same one. It usually starts with the dog bark alert. I take the dogs in. The snake makes it's way around the yard and is gone. 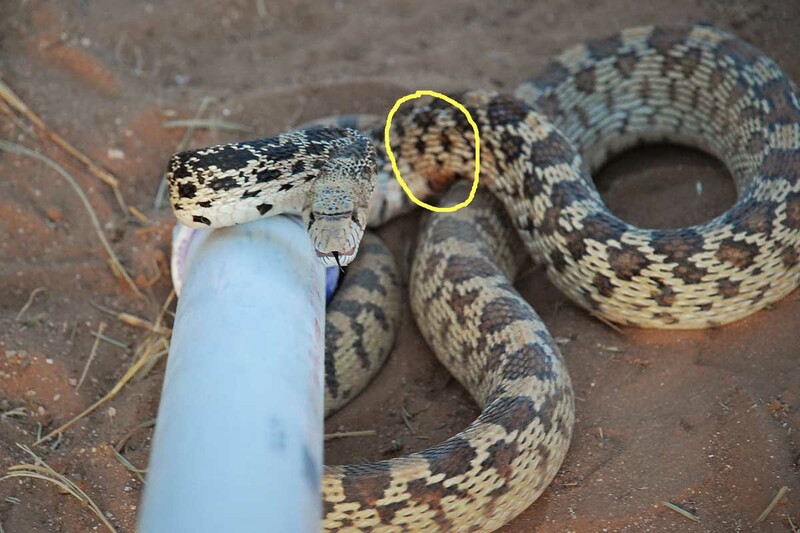 According to Vet on the Edge, where you see bull snakes, you are less likely to see rattlers. Okay, once I stopped laughing, I went to the WD 40 website and you definitely have to send them the photos and the story if you haven't already. They will appreciate it as much as we all did. Go Smooch! Love the slippers. This was the best! I loved your theory. Makes perfect sense to me. My goodness that was a big snake. So glad he was not a rattler but since the tail was out I assume you could tell w/o much fear. Whew! Oh my GOSH! My husband would have flipped out if he found that! Great story. And I love the "theory" picture! Too funny! What an absolutely cool post! I like the respect you showed for the snake, and your patience. And your slippers! Oh my gosh! You have the most interesting adventures with your animals! I agree with others, send it to WD-40. It obviously helped in some way, since the snake couldn't get out right before you used the lubricant. i am always entertained by your posts; but I have been this level of entertained since the whole George and Alan argument 3 part episodes: that'll always be my fav. Smooch is a superhero in my eyes. I just hate snakes. Great story and I would submit it to WD-40. I *love* the look on Smooch's face when you catch her in the act of digging that (damn big) hole. Adorable. Wow - this is the funniest story ever! And you're very brave. If you let the makers of WD-40 know about that story, they might give you a lifetime supply! Oh, I see, on your twitter thingy that you you already did share it with them. Holy crap! That thing was huge! I have chills all the way over here! Very pretty though. And for the record, I'd submit it anyway. It's a pretty cool story! this story and those photos just made my day :-) thanks! Great story and now you can add snake wrangler on your resume.